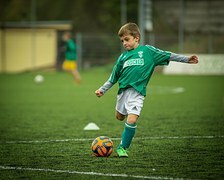 As the popularity of youth soccer has risen in America, so has the incidence of soccer related foot problems. Poorly fitting cleats are a common issue for kids. Snug cleats, along with the repetitive kicking required by the sport, is a recipe for a number of painful foot conditions. Many children receive hand-me-down cleats that do not fit properly. It is also common for soccer players to intentionally wear tight shoes to get better control of the ball. While any tight shoe will crowd the toes, this becomes especially problematic when combined with all of the repetitive kicking that soccer demands. This commonly results in skin problems such as blisters and the formation of ingrown toenails. Toenail pain is common in young people but even more so in soccer players. The first step is to address the proper fit of the shoe. If nail pain continues, there is a simple procedure that can correct this problem. The doctors of Coastal Podiatry Associates provide specialty care for ingrown toenails which involves a 10-minute procedure performed in the comfort of the office. The procedure is performed with a local anesthetic and involves either temporary, or if needed, permanent removal of the painful nail border leaving the nail with a normal cosmetic appearance. The healing process is quick and activity can be resumed in 1-2 weeks. A second common issue that can result from wearing hand-me-down shoes involves a viral infection of the skin commonly known as a wart. Such warts can become quite painful over time. The combination of excessive sweating and friction weakens the skin’s ability to keep such viruses out. All such warts should be evaluated and treated as the virus can spread over time. Treatment options vary and may involve the use of simple topical and/or oral medications. In more severe cases, laser treatment may be needed. Fortunately, the board certified physicians at Coastal Podiatry Associates are able to offer the latest and most effective treatments allowing your child to get back on the field in no time. Am sending this article to my grand daughter. She has had a wart on her foot that has been very painful. She is seeing a doctor and getting it treated. I thought sending her the article would be informative as to how she probably got the wart. She has a soccer scholarship for college. and sore feet should not be included in this mix. Thank you for a good read.